Let us look at five blue-chip stocks that reinvented themselves and shone brightly in the last decade. They could very well be your stocks for the next decade. If you log into your Twitter account, it is very likely that the one hashtag (#) you will not miss is the 10-year challenge hashtag. Twitterati are being invited to post their pictures in 2019 vis-à-vis their pictures in 2009 and see the difference for themselves. Does this make you wonder how such a challenge would be like for Indian stocks? January 2009, which was exactly 10 years ago, saw a tumultuous time for global markets. Financial services company Lehman Brothers went bust and left the global financial system on the brink of crisis. Prophets of the doom termed it the “end of equity markets as we knew it”. But there were also green shoots of hope. Global central banks were infusing liquidity at an unprecedented pace and most of it found its way into the equity markets. 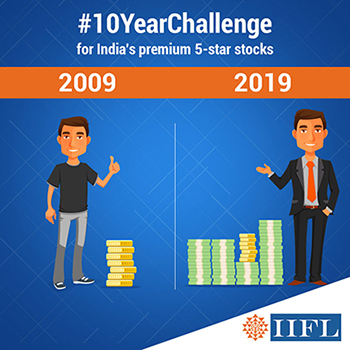 As we look back, some of the marquee stocks in India have done appreciably well in the last 10 years. Let us look at five such blue-chip stocks that reinvented themselves and shone brightly in the last decade. They could very well be your stocks for the next decade. There is a constant debate surrounding the most valuable Indian company: TCS or Reliance. Actually it does not matter. An investment of Rs10,000 in TCS in January 2009 would be worth Rs1,57,900 today. That is a CAGR return of an unbelievable 31.78% in the last 10 years. As most technology companies felt the heat of weak US spending and pricing pressures, TCS proactively went about expanding its digital franchise by preparing itself for emerging areas like mobility, cloud, analytics, artificial intelligence, etc. In the last five years, it has sharply widened its wealth gap over Infosys. If one stock were to represent the expanding and aspirational middle-class, it would be Maruti Suzuki. By virtually dominating the passenger car segment and offering the widest choice for the most granular market classification, Maruti has come to represent everything that an Indian consumer company must do. Over the last 10 years, an investment of Rs10,000 in Maruti would have grown to Rs1,40,800, i,e., CAGR returns of 30.28% over 10 years. You would be hard-pressed to name investments in India that would have given such returns. An investment of Rs10,000 in HDFC Bank in January 2009 would be worth Rs1,07,100 today, an appreciation of 971%. That translates into a CAGR return of a whopping 26.78% in the last 10 years. A solid focus on asset quality and a rapid shift to the retail lending book paid rich dividends for HDFC Bank. Today, HDFC Bank alone has a market capitalization that exceeds the combined market cap of all PSU banks in India put together. That surely says a lot. Over the last 10 years, Mukesh Ambani’s Reliance Industries has given CAGR returns of 13.86%. Prima facie, this may look less impressive compared to other blue-chips. However, one needs to remember that the rally in Reliance has just lasted for the last two years since Jio was launched. However, Reliance just became the first Indian company to cross Rs10,000cr in quarterly profit. Its massive investments in retail and telecom are just about beginning to pay off. Despite all the pressures of the oil market, RIL has sustained gross refining margins at twice the Singapore benchmark. It is these unique features that make the stock an essential pick for the next 10 years. We specially included this stock to highlight how a quality stock purchased at the right time can change the structure of your portfolio returns. Eicher was languishing exactly 10 years ago, but an investment of Rs10,000 in January 2009 in Eicher would have been worth Rs8,38,600 today. That translates into CAGR returns of 55.73% per annum. This is after the stock corrected nearly 35% from its peak in early 2018. The moral of the story is that quality stocks always reinvent and outperform. Use sharp corrections to buy into them and they will rarely disappoint you in the long-term! The rest we will leave it to your imagination.